Surya Namaskara (सूर्यनमस्कार), or Sun Salutation, is a warm up routine based on a sequence of linked asanas. The name refers to the symbolism of Sun as the soul and the source of all life. 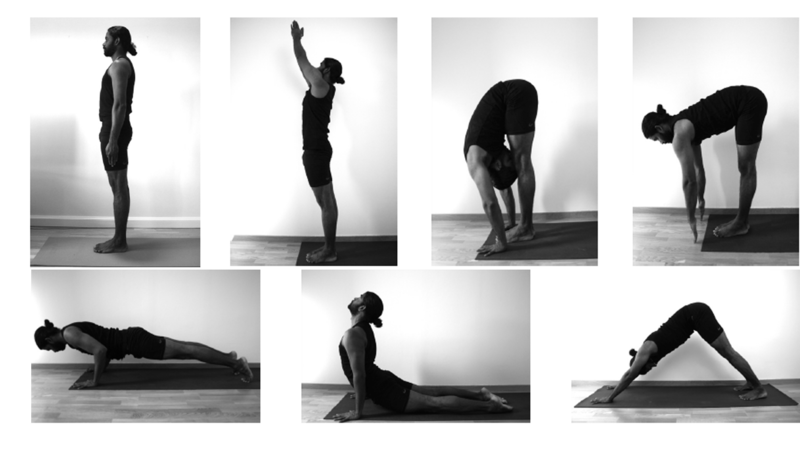 Sūrya Namaskāra refers to a number styles of ”Sun Salutations” and a yogi may develop a personalized yoga warm up routine as surya-namaskar to precede his or her asana practice. 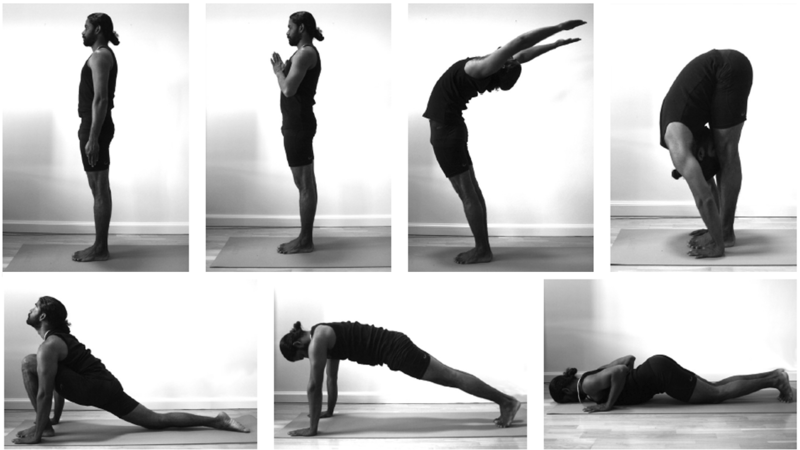 12 Surya Namaskaras are traditionally practised per cycle. Surya Namaskar A is one of the sun salutations opening the Ashtanga Vinyasa Primary Series, the following one being Surya Namaskar B. Preceding the Primary Series 5 rounds of Surya Namaskar A are traditionally practised. The Surya Namaskar A is also the most common version of Surya Namaskar in the ritual 108 Sun Salutations, when a continuos flow of 108 Sun Salutations is performed. Surya Namaskar B follows the Surya Namaskar A as one of the sun salutations opening the Ashtanga Vinyasa Primary Series. 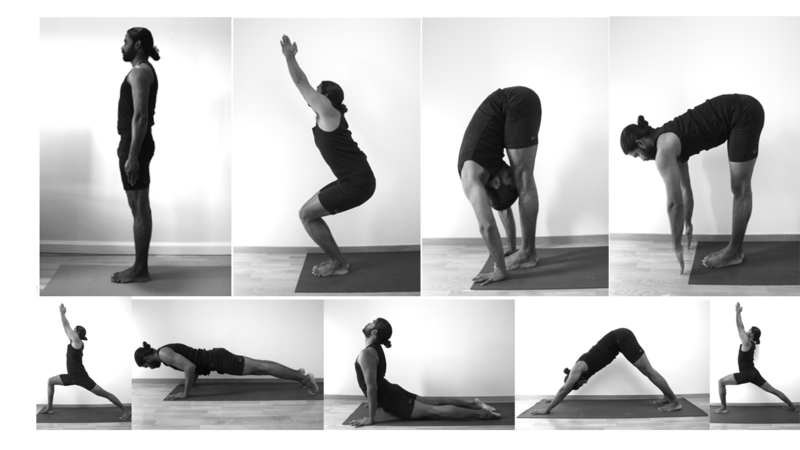 Preceding the Primary Series 5 rounds of Surya Namaskar A and 5 rounds of Surya Namaskar B are traditionally practised. According to the Sivananda tradition one round of Sun Salutation consists of two sequences, the first leading with the right foot in positons 5 and 10, the second leading with the left. Keep your hands in one place from positons 4 to 11 and co-ordinate your movements with your breathing. Start by practicing four rounds and gradually build up to twelve rounds. Stand erect with feet together, make sure your weight is evenly distributed. Inhale. Hands in the prayer position in front of your chest. Exhale. Exhaling, curl your toes under, raise your hips and pivot into an inverted ”V”shape. Try to push your heels and head down and keep your shoulders back. Exhaling, bring the other leg forward and bend down from the waist, keeping your palms as in position 4. Inhaling, streach your arms forward, then up and back over your head and bend back slowly from the waist, as in position 3. 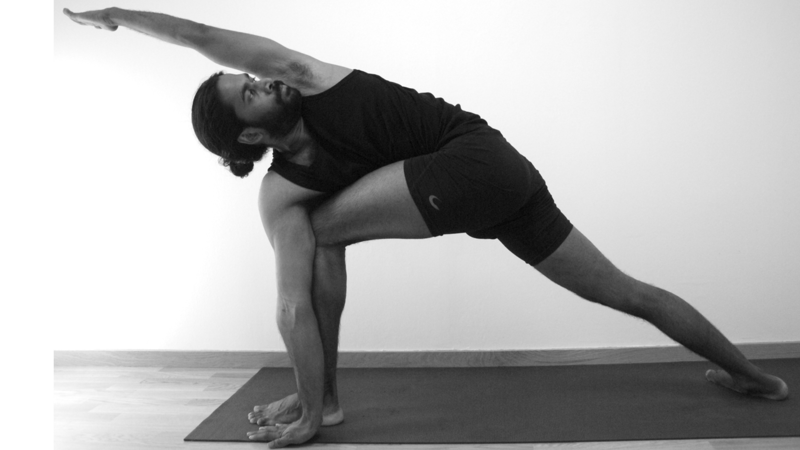 Adho Mukha Svanasana is one of the poses in the traditional Sun Salutation sequence. It’s also an excellent yoga asana all on its own as it calms the brain, helps relieve stress and energizes the body. Strengthening the arms and legs. > Hands: Hands are shoulder-width apart, spread your palms, index fingers parallel. > Feet/legs: Feet are hip-width apart, and parallell. Hips move upwards and back. In modified posture knees can be slightly bent and the heels lifted away from the floor. > Upper body: Legthen the spine keep your belly towards the spine. Keep shoulder away from the ears and broaden between the shoulderblades. Stretches och strengthens the shoulders, hamstrings, calves, arches, and hands. > Relieves headache, insomnia, back pain, and fatigue. > Therapeutic for high blood pressure, asthma, flat feet, sciatica (lower-back pain), sinusitis (pain in sinusis). Modification: Hold for minimum 5 breaths in Sun Salutation (all levels) or 30 sec (beginners), 1 to 3 minutes (intermed/advanced) if practised alone. Full position: Hold for minimum 5 breaths in Sun Salutation (all levels) or 30 sec (beginners), 1 to 3 minutes (intermed/advanced) if practised alone. People with Carpal tunnel syndrome shall only practise preparin posture (Uttanasana). Do not practise Adho Mukha Svanasana if you suffer from diarrhea. > Pregnancy: Do not do this pose late-term. > High blood pressure, headache or menstrual discomfort: Support your head on a bolster or block, ears level between the arms. The pose is one of the most basic asanas, but even though it’s not complex it has great benefits for strengthening the body as well as opening the shoulder area and chest. 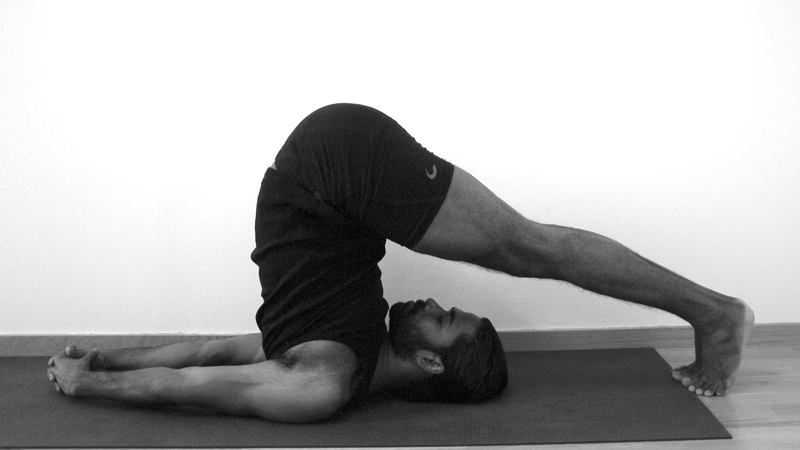 For beginners this pose can be challenging but it is of great use as a preparation for more advanced asanas. It also strenghtens the heart. > Feet are together. Spread the toes, tuck the tail bone under (don’t arch), straight arms- press the palms together. You should see the toes in front of the knees if you look down. This asana tones up the ankles, knees and thighs. It corrects defects in the calves and thighs, develops the chest and reduces fat around wait, hips and relieves sciatic and arthritic pains. > Feet are one leg-length apart. Turn right foot forward, left foot 45 degrees. Align the feet in a straight line, press the inner seam of the front foot and the outer heel of the back foot, lengthen the spine and rotate from the hip, rotate the armpit towards the ceiling. > Neck problems: don’t turn your head to look at the top arm; instead look straight ahead with the sides of the neck lengthened evenly, or look down at the floor. Trikonasana is the last of the 12 basic asanas that are supposed to be mastered before attempting more advanced practise according to Sivanande tradition. It gives a very good lateral movement to the spine, and is an auxiliary pose to Ardha Matsyendrasana, amplifying and fullfilling the Half Spinal Twist. > Therapeutic for anxiety, stress, flat feet, infertility, neck pain, osteoporosis, and sciatica. > Heart Condition: Practice against a wall. Keep the top arm on the hip. > High blood pressure: Turn the head to gaze downward in the final pose. > Neck problems: Don’t turn your head to look upward; continue looking straight ahead and keep both sides of the neck evenly long. > A: Square the hips turn the back foot in 45 degrees (front foot facing forward). Keep the back leg straight and press the inner seam of the front foot to the mat and the outer heel of the back foot. Without arching the back or raising the shoulders arms above the head, palms together. Keep the arms straight and the shoulders down. > B: Front knee 90 degrees, press the inner seam of the front foot and the outer heel of the back foot, tuck the tail bone under, keep the shoulders down- lengthen between the hands and up. > Neck problems: Don’t turn your head to look over the front hand; continue to look straight ahead with both sides of the neck lengthened evenly (B). Keep head in a neutral position and not look up at the hands (A). 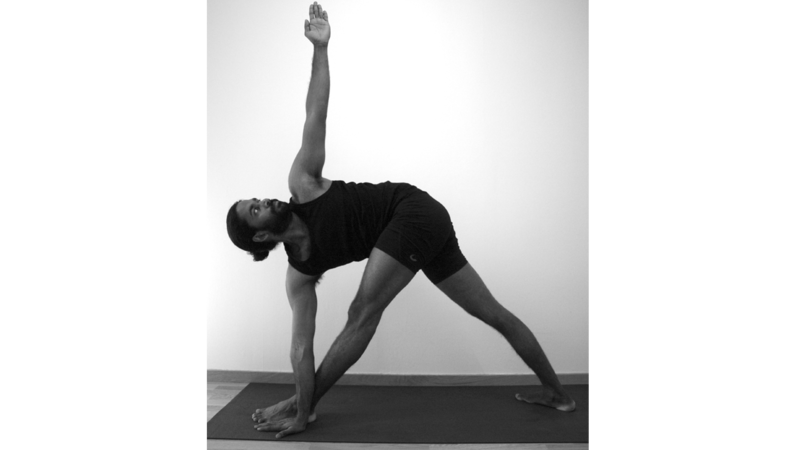 According to the Ashtanga Vinyasa series this posture is the counterpose to Utthita Trikonasana (simular to Ardha Matsyendrasana). The pose and the counterpose enhances each other, stimulating and rejuvenating the spine and hip area as well as abdominal organs. 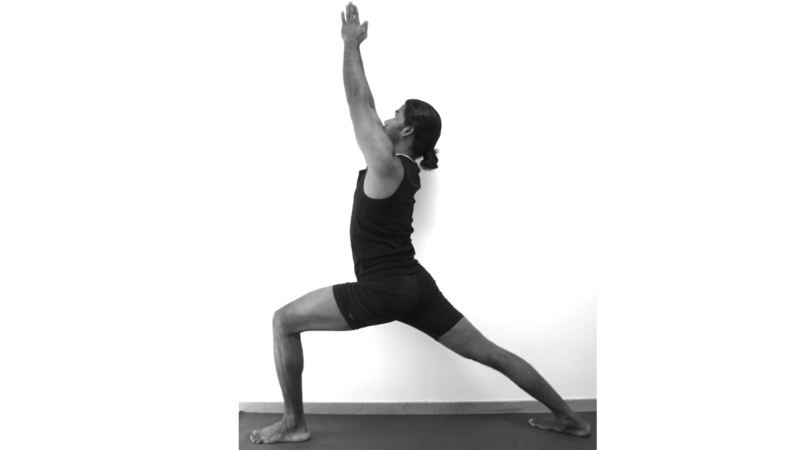 Trikonasana sequence is specially good to tone the hamstring and thigh muscles. > Feet are leg-length apart. Square the hips, lengthen the back and neck, rotate from the hip-stable hip. > Modification: Shorten the distance between the feet, place hand on foot or calf, keep second hand on hip. 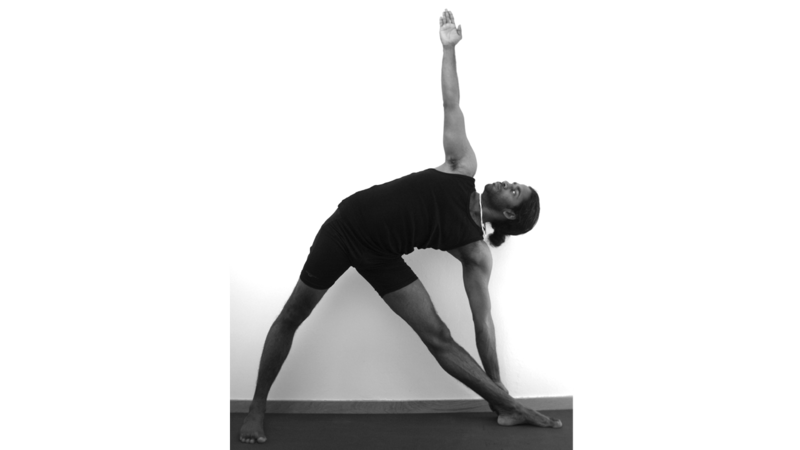 Drishti: If hand towards the ceiling- hand, if hand on hip- front foot. > Back or spine injury. 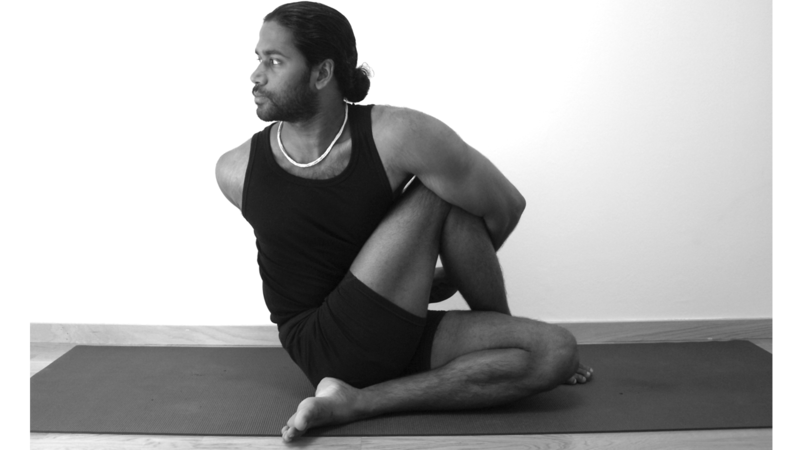 Perform this pose only with the supervision of an experienced teacher. This asana is more powerful than the Parivrtta Trikonasana and has greater effect. The contraction of the abdominal organs helps digestion and the blood circultaion of the abdomen and spinal column is stimulated. The asana helps to remove waste matters from the colon without strain. > Feet are one leg-length apart. Drop the back knee to the floor, upper arm outside thigh, lengthen the waist (both sides long) and rotate from the hip. > Preparation: back knee on the floor. Hands in namaste. > Modification: If you can’t easily keep your back heel down in this pose, lift the back heel off the floor. Hands in namaste. If you have any neck problems, don’t turn your head to look at the top arm; instead look straight ahead with the sides of the neck lengthened evenly, or look down at the floor.look straight ahead with the sides of the neck lengthened evenly, or look down at the floor. 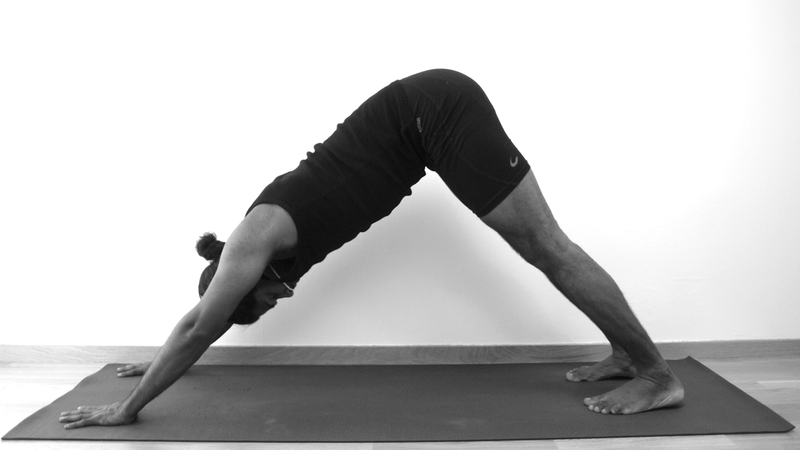 The Camel Pose stretches the entire front of the body and strengthens back muscles. The pose improves your posture and stimulates the organs of the abdomen and neck. > Feet/legs: Knees hip width apart. Press your shins and the tops of your feet firmly into floor.Lengthen the back and the pelvis down through your tail bone, slightly firm the tail forward. Make sure though that your front groins don’t “puff” forward. To prevent this, press your front thighs back, countering the forward action of your tail. Lift your heart by pressing the shoulder blades against your back ribs. > Hands: Rest your hands on the back of your pelvis, bases of the palms on the tops of the buttocks, fingers pointing down. ful not to strain your neck and harden your throat. > Stretches the ankles, thighs, groins (psoas) as well as the abdomen and chest, throat. > Stretches and strengthens back muscles. > Stimulates the organs of the abdomen and neck. 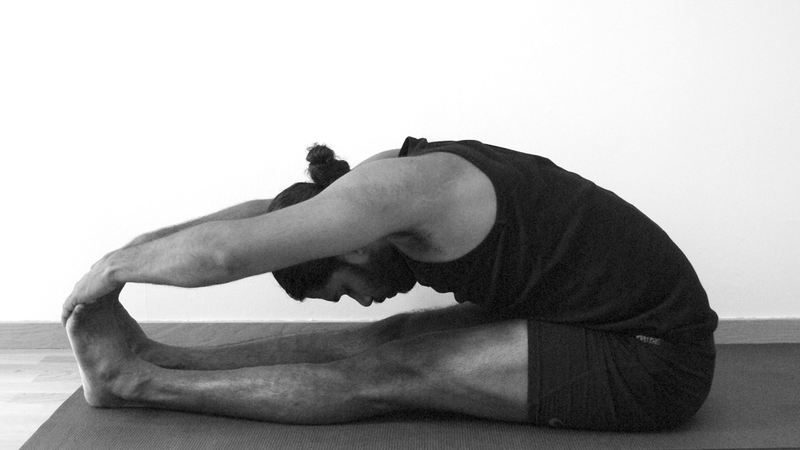 Urdhva Dhanurasana is the beginning of the advanced and difficult backbending poses. It tones and streches the spine and strengthen the arms and writs. At the same time as it gets the body alert and awaken it sooths the head. Most of the restraint you might feel towards this pose is probably fear, so be fierce. > Place the feet behind the buttocks, hip width apart, place the hands by the ears, thumb finger pointing towards the feet, press the feet and hands and lift the hips up, keep the knees from dropping to the sides and open the upper back. To come down slowly bend the arms and come down on the head and then release the hips down. ping to the sides. To come down slowly release the hips to the floor. > Preparation: Hold the ankles with both hands, lift the hips and draw the tail bone forward, continue lifting the hips and interlace the fingers and walk a little bit higher up on the shoulders, don’t drop the knees to the side keep contact in the legs and press from the feet. Full position: Hold 30 sec-1 min (intermed/advanced). > Legs: Back-leg should extend straight out of the hip (and not be angled off to the left), and rotated slightly inwardly, so its midline presses against the floor. 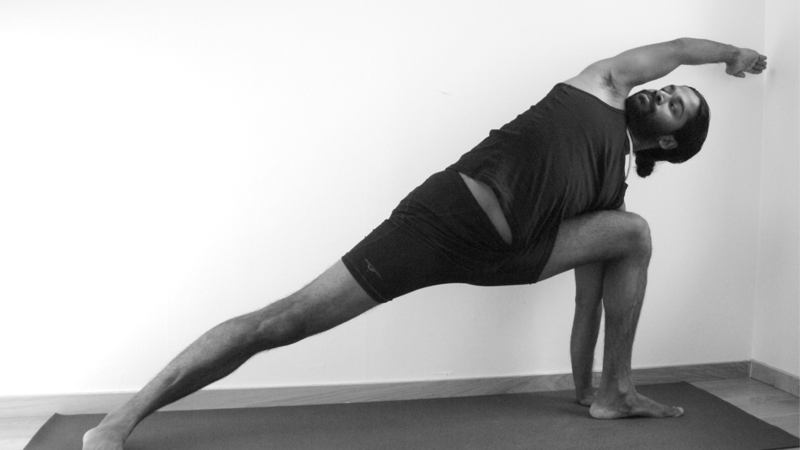 The knee of the front-leg should ideally be in a 90 degree angle, if not, do not attempt to deepen into full pose. > Upper body: Lengthen the lower back by pressing your tailbone down and forward; at the same time, and lift your pubis toward the navel. Roll your left hip point toward the right heel, and lengthen the left front groin. 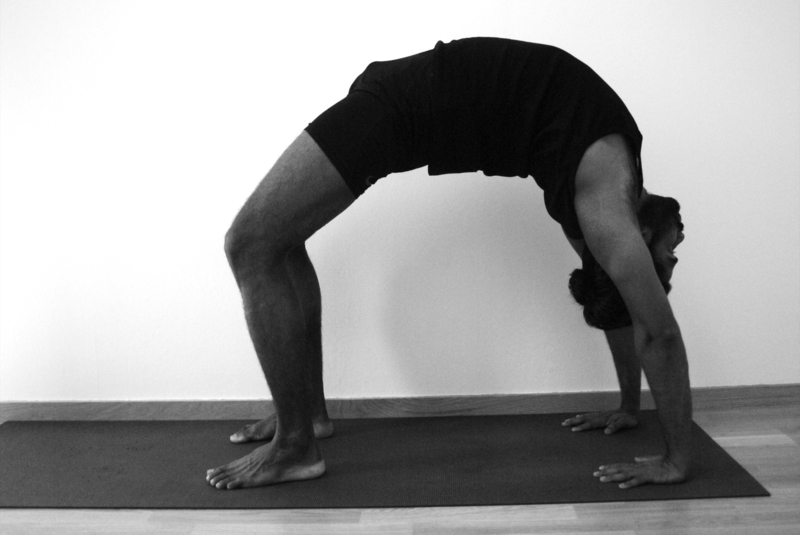 The Bow Pose may be seen as a counter-pose to Halasana and Pashimottanasana. It’s a full backward bend to supplement these two forward bending exercises. In the Bow, all parts of the back are worked simultaniously, incerasing strength and suppleness in the spine and hips. He who does Halasana, Mayurasana and Dhanurasana can never become lazy. > Feet/legs: Make sure your knees aren’t wider than the width of your hips, and keep your knees hip width for the duration of the pose. > Draw the tops of the shoulders away from your ears. > Breathe more into the back of your torso, and be sure not to stop breathing. > Theraputic for constipation, respiratory ailments, mild backache, fatigue and anxiety. Full position: Hold for 10 to 30 seconds, repeat 3-5 times, on last attempt, try the rocking bow. > Serious lower-back or neck injury. Students with any of these problems can however practise preparing poses. The Bridge Pose is a very simple yet a powerful pose, it complments and enhances the benefits of both the Shoulderstand and the Plow. It stretches the chest, neck, spine and rejuvenates tired legs and it also has many theraputical benefits. > Hands/arms: Press your arms actively into the floor (prep-mod). > Feet/legs: Place the heels as close to the sitting bones as possible, feet are hip-width apart, and parallell. Press your inner feet actively into the floor. Keep your knees directly over the heels. > Pelvic region: Push your tailbone upward toward the pubis when entering the position. When in the position lengthen the tailbonentoward the back of the knees. Lift the pubis towards the navel. > Chest/neck: Lift your chin slightly away from the sternum and, firming the shoulder blades against your back, press the top of the sternum toward the chin. > Theraputical for asthma, high blood pressure, osteoporosis, and sinusitis. Neck injury: avoid full pose (place a thickly folded blanket under your shoulders to protect your neck). 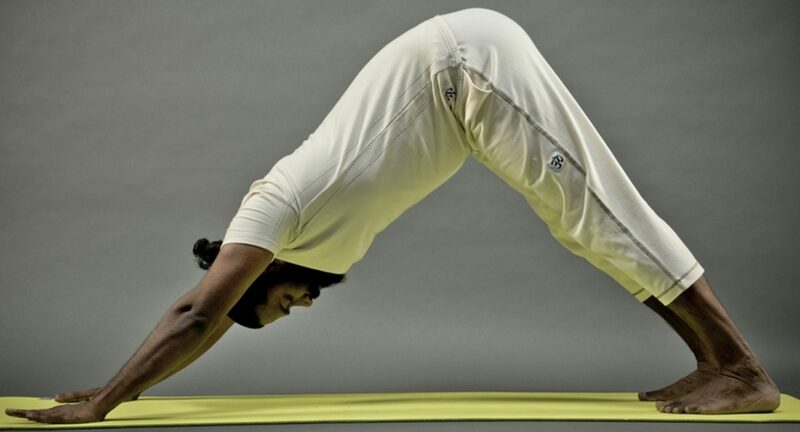 Regular practise of forward bends helps to keep the spine elastic, the joints mobile, the internal organs toned and the nerv system inviogorated. In Paschimottanasana the body is folded almost in half, providing a comprehensive stretch to the entire back of the body from the scalp down to the heels. Together with Sirsasana and Sarvangasana, Paschimottanasana is considered one of the most important asanas to maintain perfect health. > Hold the knees together press the inner seam of the feet forward, hold the toes with the index, long and thumb finger fold forward from the hips, lift the elbows (A); look up between the eyebrows; hold the side of the feet, lift the elbow and fold from the hip (B); look up between the eyebrows; interlock the fingers behind the feet and touch the forehead to the knees (C). Drishti: Tip of the nose, along the back of the nose, between postures look up between the eyebrows. Full position: Hold each for minimum 5 breaths in vinyasa (all levels) or up to 15 min (intermed/advanced) if practised alone. > Back injury: Only perform this pose under the supervision of an experienced teacher. 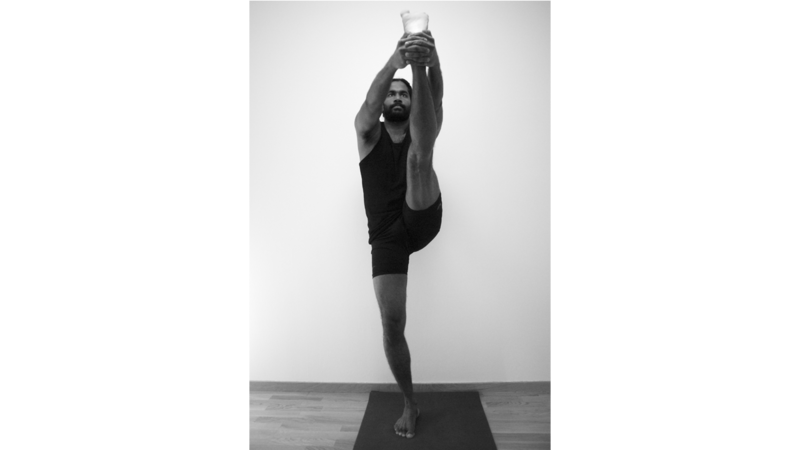 This asana takes it’s Sanskrit name from the great sage Matsyendra, one of the rst teachers of Hatha Yoga. Traditional texts say that Ardha Matsyendrasana increases appetite, destroys most deadly diseases, and awakens kundalini. After backward and foreward bending the half spinal twist gives a lateral stretch to all the vertebraes, back muscles and hips. Press the inner right foot very actively into the floor, release the right groin, and lengthen the front torso. Lean the upper torso back slightly, against the shoulder blades, and continue to lengthen the tailbone into the floor. With every inhalation lift a little more through the sternum, pushing the fingers against the floor to help. Twist a little more with every exhalation. 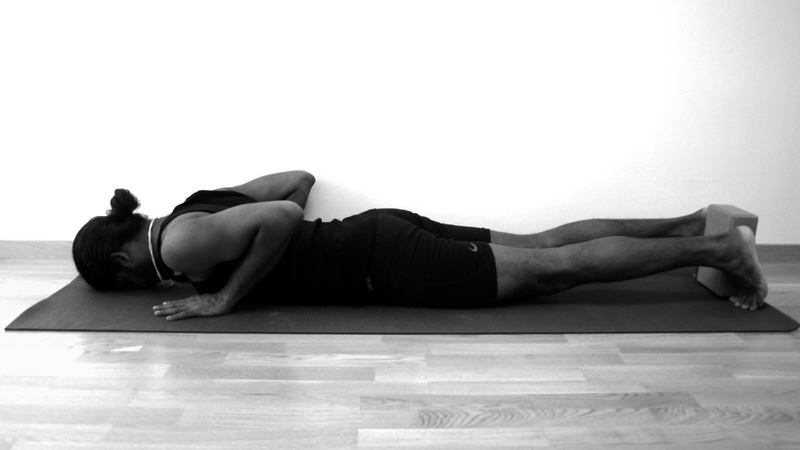 Back or spine injury: Use caution and perform this pose only with the supervision of an experienced teacher. Do not attempt full pose or use corrections to get into the pose. When teaching this pose some extra demonstrations and explanation is often required initially. Keep track so that all students of the class are following and facing the same direction. The Shoulderstand is said to benefit all the parts of the body, hence its Sanskrit name comes from ‘sarva anga’ which means ‘all parts’. It is also known as the queen of all yoga poses, Headstand being the king. According to some there are three asanas which alone will keep you in perfect health: Headstand, Shoulderstand and Forward-bend. > Preparing pose: Keep lenghtening the back of the body, press the palms towards the floor. > Modification: Keep the elbows close to the body, keep the head still. > Full position: Keep your neck long, don’t collapse the chin towards the chest. Keep the head still. > Opening the chest and shoulder area, releasing pressure. > Balances the tyroid function, beneficial to your metabolism. > Can reduce headache and relieve indigestion/constipation and stomach problems. Do not practice modification or full pose in the beginning of your menstruation or if you suffer from high bloodpressure. 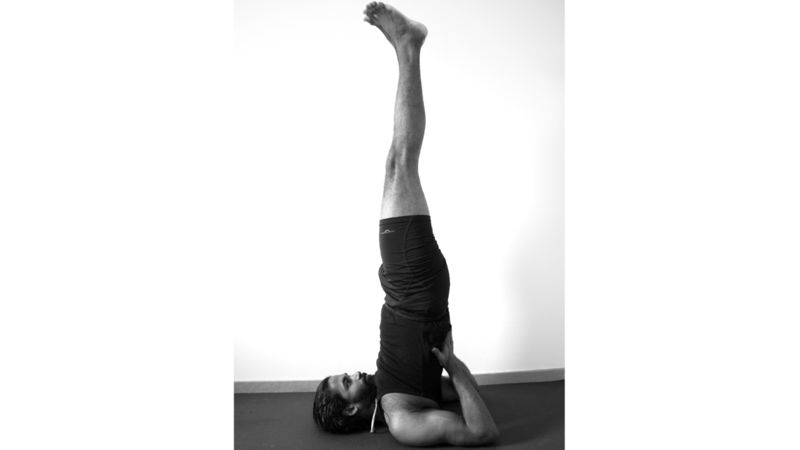 Sarvangasana can be beneficial to stabilize the bloodpressure, but people who suffer from high bloodpressure shall always consult their doctor before attempting full inversions. 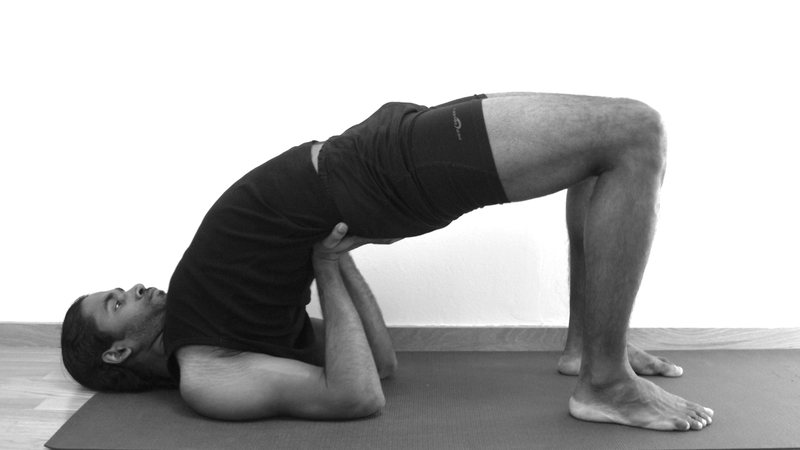 The Plow is a forward bending position that stretches the entire spine, but the main focus is on the cervical region. 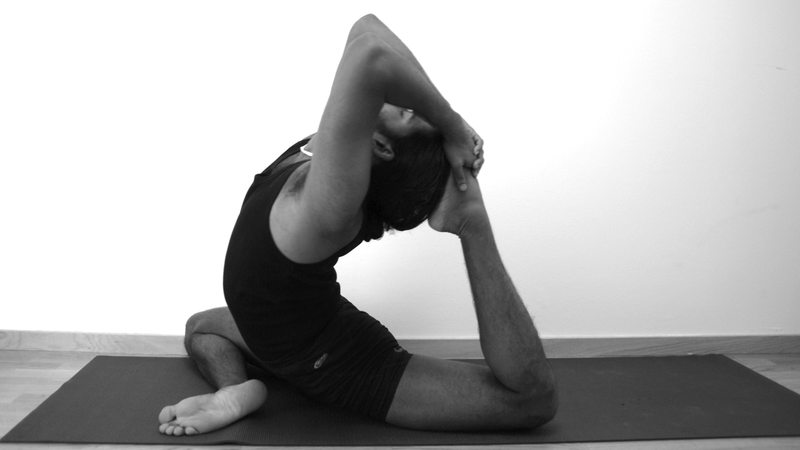 It renders the spine more flexible and healthy, also stretching the hips and leg muscles. The pose might look fairly easy but with the feet on the floor, it’s considered to be intermediate to advanced. Don’t attempt the full pose without sufficient prior experience unless you have the supervision of an experienced instructor as you might cause injury to the neck. > Support the back and lower the feet behind the head and if possible touch the toes on the floor, if the toes touches the floor release the hands from the back and interlock the hands behind the back pressing the hands towards the floor (release the pinkie and ring finger), walk the toes towards the head if possible, create a small space between the chin and the chest. > Modification: Keep hands on back if not able to place toes onto the floor. Full position: Hold 30 sec-3 min (intermed/advanced). > Asthma & high blood pressure: Practice Halasana with the legs supported on props. > Pregnancy: If you are experienced with this pose, you can continue to practice it late into pregnancy. However, don’t take up the practice of Halasana after you become pregnant. The Fish gets its name because it’s easy to float in water when in the advanced (Fish in Lotus) variation. This is because the pose releases the inhibitations on the lungs thus allowing greater capacity to fill with air. 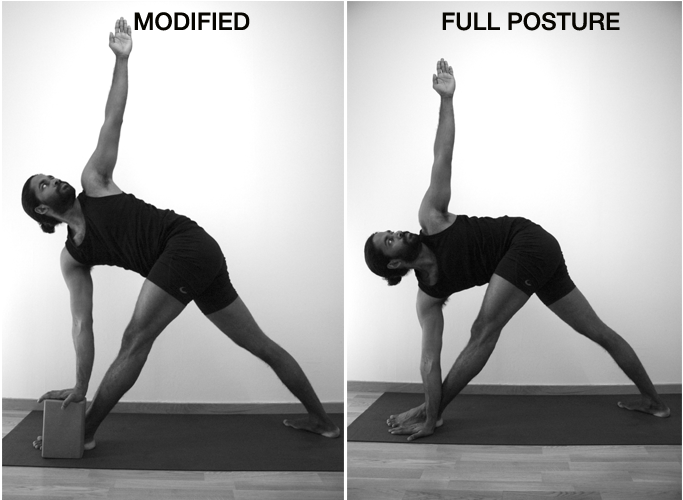 To derive the maximum benefit the Fish Pose should be done after the shoulderstand. > Directly from Sarvangasana: Support the hands on the back and come back to Sarvangasana, lower the legs 90 degrees over the head and place the hands on the side of the hips, slowly roll down vertebra by vertebra and place the buttocks on the hands and legs in a cross legged position, press the elbows to the mat arch the back and place the crown of the head on the floor.